What Is Folk Art Painting? Folk art painting, like folk music and folklore, is an art form that comes from the traditions and experiences of the common people. According to the American Folk Art Museum, though folk art began as a way of decorating the home and surrounding environment, during the 20th century, the art world also began to view folk painting as legitimate art. A folk artist is self-taught, rather than educated or trained in art, and doesn't follow the classical traditions or trends of the mainstream art world. She tends to produce simple paintings about things she knows personally; the subjects of her paintings are generally not intended to look realistic. A lack of—or sometimes rejection of—technical skills, such as perspective, is one of the main traits that identifies folk art painting. 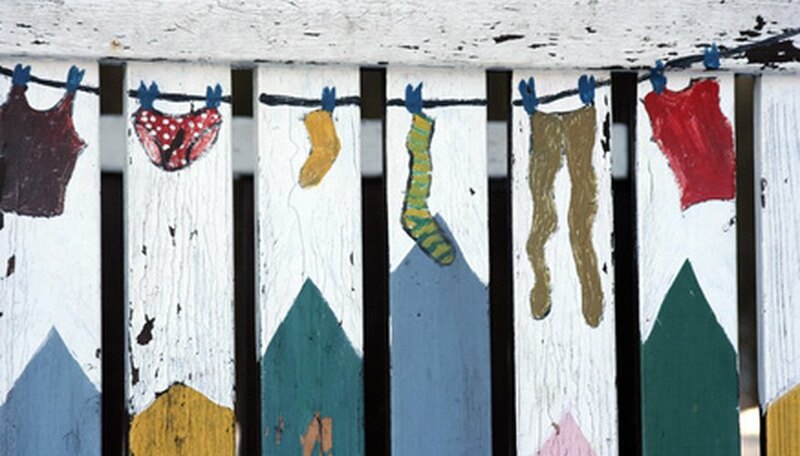 In addition to using canvases or boards, folk artists paint on many common household items as well as on outdoor surfaces, such as fences or walls. Artists can use all types of paint, including oil and acrylic paints as well as nontraditional choices, such as vegetable dye. The collection at the American Folk Art Museum includes examples of folk art painting on weather vanes, checkerboards, and wooden decoys used for fishing and hunting. A folk artist is inspired by his surroundings rather than classical art or abstract ideas, so many folk art paintings depict rural life or everyday activities and use materials that are widely available. Grandma Moses, a famous and influential American folk artist, painted mainly from her memories and constantly gave her paintings away as gifts because she considered her art a hobby. As a traditional art form, folk art painting is not attached to a particular location or time period. However, what you might commonly recognize as American folk art painting first began as exhibitions in the 1930s, and collections included both contemporary pieces and folk art produced in the previous two centuries. Many of the most recognized folk art painters, including Grandma Moses, Maud Lewis and Minnie Evans, began working during this period. Folk art continues as an art form today under many different names, including "outsider art," "naive art" and "self-taught art." Folk art painting has significance both to the average person who enjoys it in her home and to the greater art world. What began as simple decoration is now collected in many major museums and galleries, including the Smithsonian Institution and the American Folk Art Museum. Folk art painting still adorns many homes, but universities and art museums around the world now also study and display this art form. A transplant from a prairie farming town to the city of Toronto, Drew Somers published her first article in 1994. She began working as a proofreader and copy editor for agricultural trade publications in 2000, for publications such as "Transformative Works and Cultures." Somers holds a bachelor's degree in English from the University of Manitoba. What Elements Led to the Baroque Period?